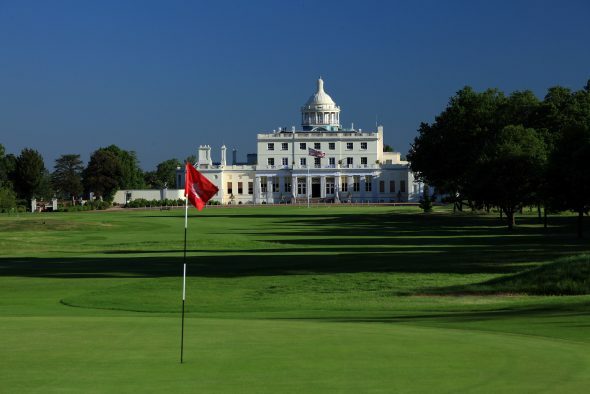 Stoke Park Country Club, Spa & Hotel, in Buckinghamshire, was the only UK members golf club to attain ‘Gold Flag’ standard at the annual 59club golf service awards – regarded by many as the ‘Oscars’ of the golf service industry. At a ceremony at four-time Ryder Cup venue the Belfry, hosted by BBC sports presenter Dan Walker, the 27-hole venue – already one of just two five-AA Red Star golf clubs in England – was awarded the prestigious 59club ‘Gold Flag’ for a remarkable fourth successive year. The awards are designed to reward the top golf venues across all business elements. International benchmarking specialist 59club presents its industry benchmarks, the Gold and Silver Flags, to the finest membership clubs and commercial venues which consistently attain the required high levels in mystery-shopper tests. Having collected the award, Stoke Park’s director of golf Stuart Collier, said: “Although this is the fourth successive year we have attained – and maintained – the required standard to achieve Gold Flag status, it never fails to make us immensely proud, nor fails to inspire us to even greater things. Set within 300 acres of beautiful private parkland estate in Stoke Poges, Bucks, Stoke Park is only 35 minutes from London and seven miles from Heathrow Airport. Laid out across 300 acres of mid-19th century, Lancelot ‘Capability’ Brown-landscaped parkland, the 27-hole golf course was designed by Colt in 1908 and has a thriving golf club with around 800 active members. The historic land on which Stoke Park stands is recorded in the Domesday Book of 1086. The celebrated course played host to the PGA Matchplay in 1910 and, even more famously, the golf match between Sean Connery’s James Bond and Auric Goldfinger, in the 1964 film, Goldfinger. It is currently halfway through a three-year course renovation plan, made possible by a substantial seven-figure investment, with each nine-hole course being worked on in consecutive winters to ensure 18 holes are always open. The third and final nine, the Lane Jackson course, will be completed during the winter of 2017/18.